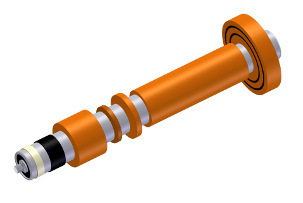 Conveyor roller covers sleeves spacers, also called lagging, are made from extruded urethane, PVC or Sanoprene tubing. We can also make them from flat belts or inverted V-belts. These roller cover sleeves provide space between the product and rollers, preventing products (e.g., glass, tile) from touching the rollers. Provides a better grip at high speeds on light weight products. Reduces noise and vibrations. Lagging sleeves also let you raise the height of your conveyor, and the larger roller diameter can increase conveyor speed and throughput. Moreover, roller covers used as tracking sleeves can prevent flat belts from walking and also be used as contact drive wheels. We stock orange 85A urethane sleeves for 1.9" (48.5mm) rollers with .0625" (1.6mm) wall thickness. Cut to any length you need from 2" (50mm) up. 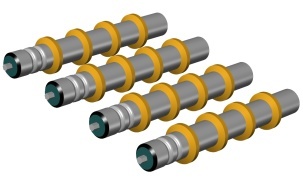 We can extrude sleeves (tubing) for any roller from .125" (3.2mm) diameter up to 3.69" (94mm) diameter. Wall thickness from .0625" (1.6mm) to .375" (9.5mm). Available in urethane, PVC and Sanoprene. See inverted V-belts spacer dimensions at V-belts. V-belt Durometers: 60A (clear), 76A (clear), 80A (brown) or 83A/85A (orange). Also available using flat belts in many widths up to 36" (914mm) and in any thickness with 1/32" (0.8mm) increments. Flat Belt Durometers: 83A/85A (clear, orange or black). Tracking sleeves are lathe cut, so ends are precisely square. Prevents flat belts from walking. Relatively low cost -- some even in small quantities. Sleeves 2" or wider are easily installed with our sleeve installation air gun tool. This tool lets you quickly install roller sleeves that are 2" or longer in length. The clear air tube is hard plastic with a pointed end that will not bend when it is pushed between sleeve and roller. See how easy it is to use by clicking on the video below. How to install Roller Covers, Sleeves, Lagging. Windows Media mp4: Click here to view the video (1mb). For the best in conveyor roller covers sleeves spacers lagging, insist on Dura-Belt.